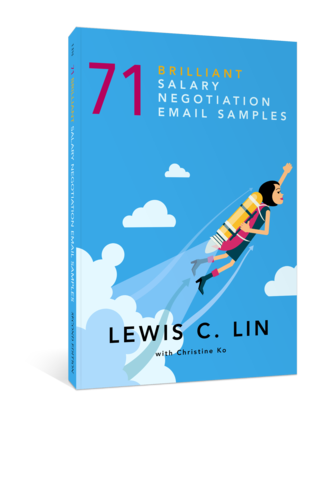 This guest post from Christine Ko, my co-author for our new salary negotiation book. You could make $1,000 a minute negotiating your salary. But it’s hard to do when you don’t know what to say. To help you out, I’ve listed ten salary negotiation email samples below. To get all 71 sample salary negotiation letters, get my salary negotiation book, 71 Brilliant Salary Negotiation Email Samples. Thank you for offering me the Assistant Sales Director position. I would like to express again how excited I am to begin working for your company. Before I can accept however, I would like to discuss the matter of compensation. As we discussed in the interviews, I have two more years of experience and formal training than you required in the job description. I have also demonstrated my capabilities in my last position at my previous company by increasing sales in my division by 25% and personally landed several multi-million dollar sales. With my expertise, an acceptable salary would fall in the range of $103,000-$112,000, a bit higher than your offer of $94,000. I can certainly see a future for myself at the company, and I’m confident that I can bring a lot of value. I know that we can come to a mutual agreement on an acceptable salary. Thank you for offering me the sales position. I’m excited about Company Z and the contribution I can make here. However, I would like to discuss compensation before I can accept the offer. While Company Z is my first choice, I have received other job offers that are offering me more compensation. In fact, the highest offer is $7000 more than the offer from here with four additional vacation days from Company Y.
I’m very interested in Company Z and I would happily accept if you could match what the other company is offering. I understand that not everything can be accomplished, but I’m willing to be flexible and find a good solution. I’m confident that I can make valuable contributions to the company, and I hope we can come to a mutual agreement. Before I can accept, I would like to discuss the matter of compensation. I am happy with the salary and I think that it is in line with my market value. However, I would be leaving my current job for this one, and I would lose out on my year-end bonus. In particular, I would be leaving a $10,000 annual bonus. To make the transition easier, I would like to request a signing bonus of $6,000 to partly bridge the gap in pay. I can certainly see a future for myself at the company, and I’m confident that I can bring a lot of value. I know that we can come to a mutual agreement on an acceptable compensation package. Thank you for offering me the Marketing Director position in Seattle. I’m excited about the position, and I’m confident that I can contribute a lot to the company. Before I can accept however, I would like to discuss compensation with you. I am currently living in Moses Lake in Eastern Washington making $70,000. While the salary you offered me of $83,000 is more than what I make now, the cost of living in Seattle is much more expensive than living in Moses Lake, making my actual pay worth much less than what I make now. For example, according to the CNN Cost of Living Calculator, housing in Seattle is 71% more, utilities are 31% more, and transportation is 19% more. I would have to make at least $91,000 in Seattle to continue my same standard of living. I would really like to work for Company Z, and I’m excited about my future potential, so I am willing to transfer for $89,500. I hope that we can come to a mutual agreement. Thank you for offering me the Director of Human Resources position. I’m excited about the position and I’m confident that I can bring a lot of value to Company Z. Before I can accept the offer, I would like to discuss compensation with you. I think that the salary is fair and in line with the market value of this position, but I would like to discuss some possible changes in the benefits. As you are well aware, I was the Director of Human Resources for four years at my previous company. In that time I have made valuable changes for them and saved them thousands of dollars through my innovative processes. Because of my qualifications, I believe that my value added to the company is more than the average Director of Human Resources. While I am happy with the base salary, I am hesitant to accept the offer because of the increased commute to the office from my home. Taking this new job will increase my daily drive by an hour. To save time, I would like to request a day every week to work from home instead of at the office. I can perform my job adequately at home while saving time and gas on my commute. This arrangement will also not cost the company any more money. Of course, we can discuss which day would be most convenient for everybody. I’m confident that we can come to a mutual agreement. Thank you again for offering me the Marketing Manager position. I’m very excited to join the team and start contributing to the company. I believe that this change will make your offer more competitive. I’m confident that we can come to a mutual agreement. Thank you for offering me the Lead Developer position. I’m excited about the job and I’m confident that I can bring a lot of value to Company Z. I’m glad that we could work out the terms of the salary and the compensation package. Before I can accept, I have one last aspect I would like to talk about. I am concerned about the lack of a severance package. I am a very thorough person, so I would like to solidify the terms of a severance package before I accept. I do not anticipate creating a reason to get fired, but I would like to know what would happen if a layoff did occur. In particular, six months wages and continued health and dental insurance coverage for nine months seems like a typical and appropriate severance package. Of course, discussing the severance package will not cost the company any money up front, and if I am never laid off, the company will not pay any money at all. Once we solidify the details of the severance, I’ll be ready to accept the job offer. Thank you for offering me the Account Manager position. I’m very excited to begin working at Company Z. Before I can accept, I would like to discuss my title in the company. As I was researching the company and its organizational structure, I noticed that there are no managers above me, but I would be responsible for managers below me. Since I will be the top manager for the larger accounts, I would like to request that my position be renamed from “Account Manager” to “Senior Account Manager.” I am not requesting any salary increases or other benefits, so this change will not cost the company any more money. I’m confident that I can bring value to the company, and the new title will help me advance in my professional career. Thank you for offering me the Software Developer position. I’m very excited to start contributing to Company Z. Before I can accept however, I would like to discuss the company policy of pay brackets. I understand that I have more experience and qualifications than other developers in my team which is why I was placed at the top of pay bracket 4. However, it is more difficult to switch pay brackets than moving up in the same pay bracket. Therefore I would like to request being placed at the bottom of pay bracket 5. I’m excited to relocate to New York and join a new team within the company. I see this new location as an enriching learning opportunity. I’m confident that I will be a new valuable team member in New York City. However, New York has a much higher cost of living than Dallas, and I have not seen any sign that my compensation will change for relocating. According to the XYZ Cost of Living database, New York will have a 10% higher cost of living. In order to maintain my current standard of living, my salary will have to increase to $88,000 from $80,000. I will also have to incur additional expenses for selling my home and finding a new one in New York. Therefore I would like to kindly ask you to consider a salary adjustment to account for the difference in the cost of living and to cover other relocation expenses. Specifically, I would like to request an 8% increase in my salary and a $10,500 additional bonus for relocation expenses. I understand if this is not possible, but I hope that we can come to an agreement. Want 60 more killer salary negotiation scripts? Check out 71 Brilliant Salary Negotiation Email Samples.